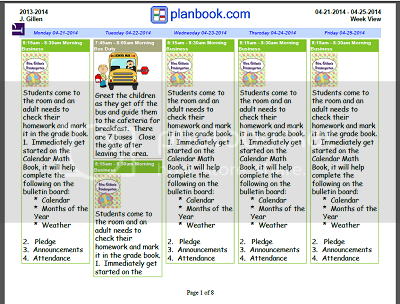 Mrs. Gillen's Kindergarten: Lesson Plans for this week! 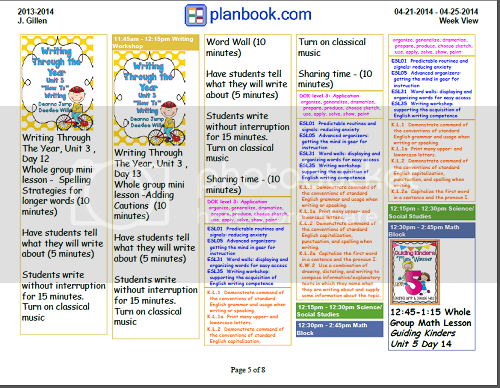 Lesson Plans for this week! I am so lucky to be linking up with this linky party. Its my first one! Check out my week! This coming week I will be at a conference for 4 days. Although I love to get trained in new techniques, it has always bothered me to leave lesson plans for a substitute. I am always worried about what the kids will actually accomplish. This week, being gone for four days could be a real disaster if I don't plan well. Last week I started new learning tubs with the students. There are 5 tubs, one for each day of the week. My class is also divided into 5 mixed ability groups. When I put the two together, voila! There is a tub for each group for each day of the week. I found some amazing learning centers on TeachersPayTeachers and my students are just loving them. This week will have students practicing skills in language arts and math all day long. 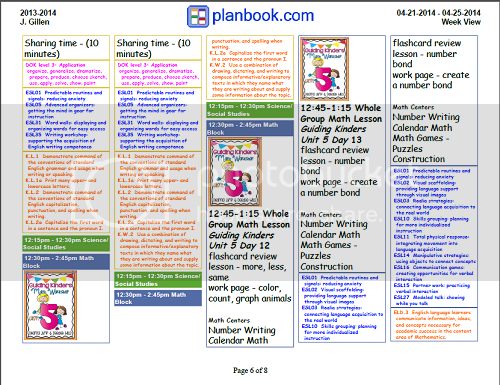 Last year a colleague of mine told me about Planbook.com, a lesson plan website. I played around with it a little and I just love it! I am able to schedule my day, tag my lessons with the Depth of Knowledge, ESL strategies, and Common Core State Standards. 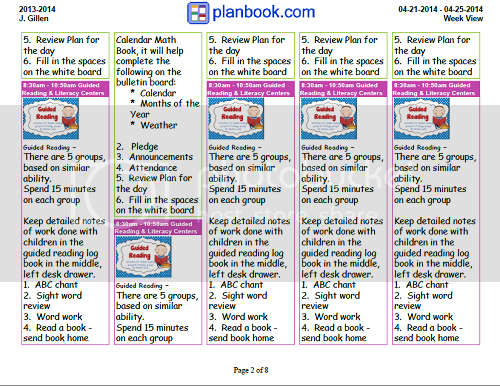 I can collect data about my plans such as which DOK do I teach most at? 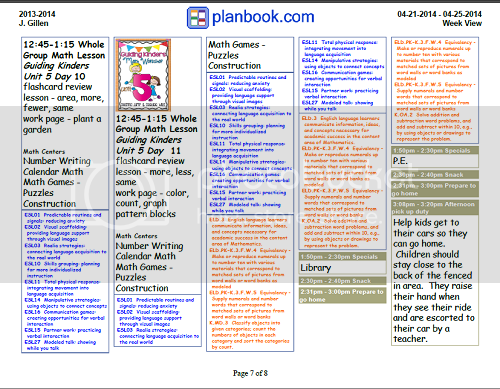 Which Common Core Standards do I need to teach more often? Do I shy away from a particular area? Am I particularly focused in one area? I LOVE this website. When I have suggestions, it seems they are always willing to comply or give me directions in a method to achieve what I desire. This weekend I learned how to insert graphics and I have been busy doing that. 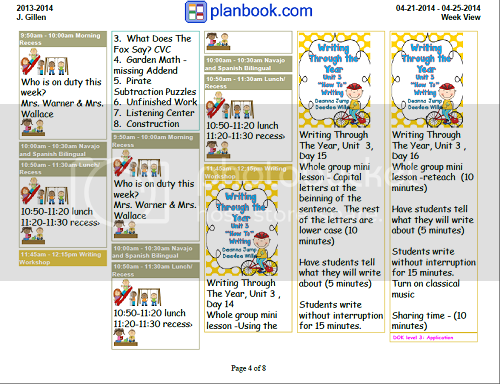 Here are some pictures of my lesson plans. It looks like a LOT of planning...and it is! My district requires a lot of documentation that we are trying to meet the needs of all learners. I am grateful that it is easy to import plans to the upcoming year and tweek them as necessary. This week I will be able to add more graphics that match what I have in the tubs. I am so excited to have learned how to do this. 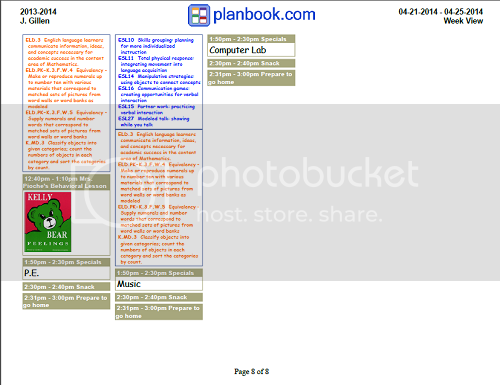 Can you share how to add graphics to planbook.com? ?